The Quad-Cycle/Amp Hour Meter is a wonderful invention and makes understanding the boat power consumption and current state of the batteries incredibly easy. If the Battery Amps on the Quad-Cycle is reading -5.3, then you turn on a fan and it reads -6.0 then the fan takes 0.7 Amps to run. If we were to leave just the fan on for 10 hours it will use 7 Amps and the Amp Hr Meter will register a loss of 7Amps. Once the Amp hr meter reaches 50% of the battery capacity in our case -440 Amps then it is time to recharge. As simple as that! Battery #1 Volts - This is the voltage as measured directly at the batteries for battery bank number 2. Bank number 2 is the 4 batteries nearest the bow. Battery Amps 0-20 - This shows total ampage in or out of the battery bank taking into account all current draws and all charging devices. Battery Amps 0-200 - Same as 3 above but with a larger scale. Because of the scale this is the selection I always use unless trying to track down a minute current loss then I would use the 0-20 scale. Alternator 0-200 Amps - This selection shows the input only from one of the three charging devices. There is a second rotating dial just to the left of the Quad-Cycle which allows for selection of Alternator, solar or wind. Usage notes:Currently the batteries are pretty old (see Batteries for recommendations) and hence we cannot achieve the -440 we used to be able to. Recently between -100 and -150 seems to be the recharge point. (See Regulators for explanation of charging strategy)I keep a close eye on voltage as well as total Amp hours and do not let voltage go below 12.2, the occasional dip is ok but running for long periods below this mark seriously shortens battery life.The Quad-Cycle has good instruction manual for configuring/understanding located in the filing boxes in the Sail Locker.The Quad-Cycle rotator dial has connections at the back that are loosening up with age and hence after rotating to a new selection, just tap the knob to get a good connection. 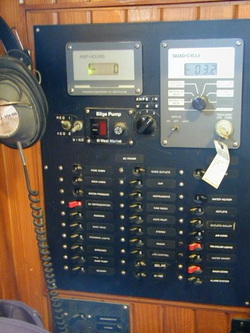 There is a spare dial in the electric repair box (located in the pilot berth in the salon) but not sure if this is new one or an old one kept by a previous owner since it may be repairable? I think this is a standard Radio Shack item anyway.The Charging device selection switch has gone beyond tapping and is not trustworthy. After selecting if you tap it, wiggle it then give it 5 mins to settle down and make a good connection it starts to read reasonable values, but I am inpatient and hence find other ways to achieve the same answer. If you want to see the current delivered by the Wind Generator, turn off solar (switch on the main control panel at the NavStation) and if the engine is running turn off the Alternator (middle position for the alternator selection switch which is located on the top left corner of the control panel at the NavStation) then turn off anything consuming current and look at the value given by the Battery Amp value.